KODA, GEORGIA. 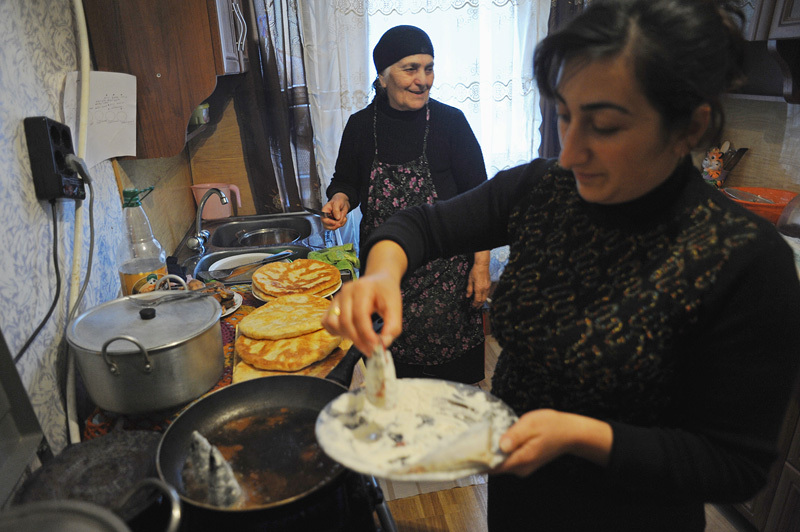 (Left) Venera Arbolishvili, 75, cooks dinner for her extended family with her daughter in the kitchen of her new home in the internally displaced persons (IDP) settlement in Koda, Kvemo Kartli, Georgia on January 20, 2012. Originally from the village of Eredvi in South Ossetia, formerly a territory of Georgia which was lost to the Russians during the 2008 August War, Arbolishvili said during the war, an unknown assailant fired from a car and killed her husband who died in her arms and subsequently she was forced to flee her home before she could bury him.